Coming Or Going, Who Wants To Live In Southwood? I often hear from our readers who live in Southwood, the most active neighborhood in Tallahassee over the past few years, and I suspect that it is time for a quick housing update for their community. As an active subdivision in Tallahassee, I consider it wise to keep a close eye on home sales, new listings, and foreclosure trends because these have a great effect on those who live in Southwood, and these changes here will often be reflective of the smaller subdivisions in the Tallahassee real estate market. 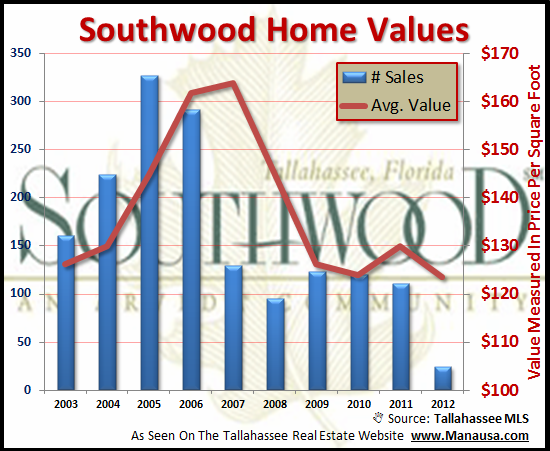 Currently, there are 68 homes for sale in Southwood (up 35% since January) and hundreds more in the shadow inventory, so we should expect home sales in Southwood to remain at or near the top of the list of most active neighborhoods in Tallahassee. If you live in Southwood, make sure new construction marketing does not confuse you ... home values are on the decline. The real estate graph above shows that new construction prices are rising, but existing home sales values are declining, just as we have seen everywhere else in the Tallahassee real estate market. Right now, the active summer market is upon us, and many people are trying to decide whether or not they want to live in Southwood. Some of these people already live in Southwood and are considering selling a home, while others are considering moving there. If you are facing this decision, whether coming or going, just drop me a note and I can schedule a time to help you evaluate your options. Remember, knowledge is power, and we can provide you with the most up to date information when making the choice to live in Southwood. Please check back again for more Tallahassee neighborhood reports, and if you live in Southwood, you know you can find more information here on a monthly basis.